#9 in fresh paint and with restored headlight, November 5, 2007. Bill Buhrmaster photo. 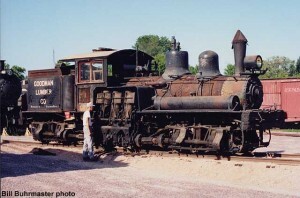 One may not immediately associate the state of Wisconsin with Shay locomotives, but over one hundred of them worked the Badger State’s woods in steam’s heyday. #9 on display in April 2000. Paul Swanson photo. 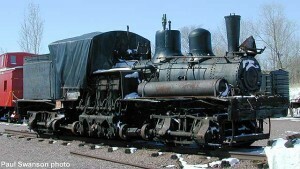 The Shay locomotive is immediately distinctive from standard steam locomotives with its unique appearance of powered trucks, offset boiler, and vertically mounted steam cylinders. All of the Shay’s wheels are driven through an arrangement of beveled gears and driveshafts, connected to a bank of vertical steam cylinders. The Shay is designed to provide large amounts of pulling power at slow speeds. Its use was found in logging, mining, and quarry lines where steep grades, sharp curves, and light rail were the norm. 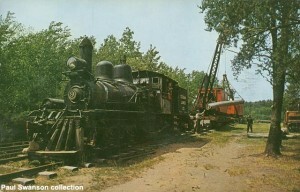 Ephraim Shay, owner of a saw mill in Haring, Michigan, invented the Shay locomotive in 1873 to haul logs on a tramway at his mill. He patented his geared locomotive in 1881 and soon sold the sole manufacturing rights to the Lima Machine Works. 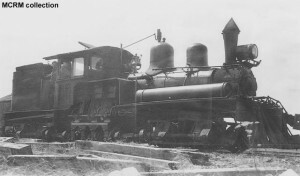 Lima quickly became known for its line of growing Shay locomotives. #9 on display at Historyland, date unknown. Paul Swanson collection. The only surviving Wisconsin Shay is Goodman Lumber #9. This 36-ton two-truck geared locomotive was built in March 1909 by Lima, along with two other sisters for the Sawyer-Goodman Lumber Company of Marinette. #9 was delivered to Goodman, Wisconsin where a new mill had just been completed while the other two were sent to Marinette. #9 at Goodman, Wisconsin 1955. Ray Buhrmaster photo. Sawyer-Goodman was formed in 1878 as a partnership with Philetus Sawyer of Oshkosh, and his son-in-law William O. Goodman of Chicago. A large sawmill was built at Marinette in 1879-80. Other subsidiary logging companies were organized/acquired: Marinette Lumber Co. in 1882; Quinnisec Logging Co. (purchased in 1891); and Goodman Lumber Co. in 1907. The Goodman community and mill were completed in 1909 and served by the Soo Line. Goodman was an early advocate of sustained-yield forest management. In 1927, selective cutting was adopted to replace clear cutting. By 1936, logging trucks and roads were better suited to logging operations and Goodman decided to phase out their railroad. Goodman Lumber Co. #9, Goodman, Wis., April 25, 1947. MCRM collection. 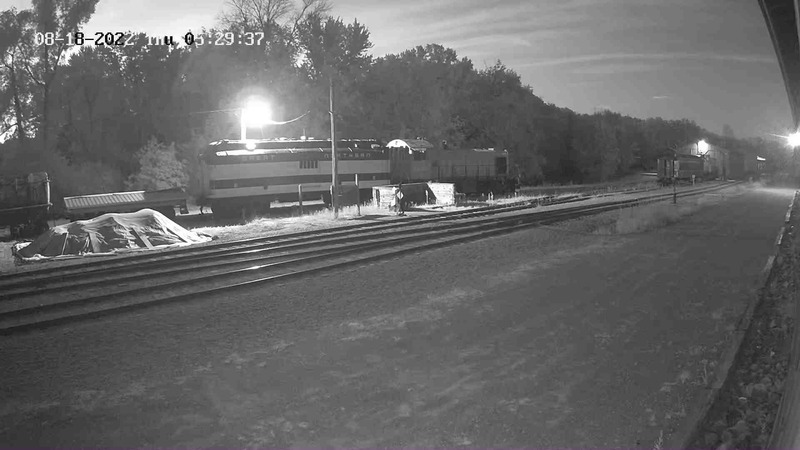 #9 worked on the Goodman Lumber Company’s private logging railroad until the mainline was abandoned in 1939. 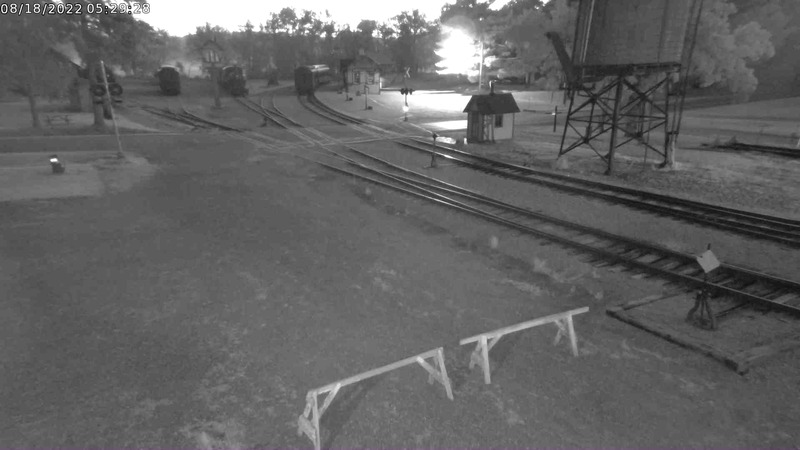 It then switched cars around the mill until it was replaced by a Plymouth diesel locomotive that was purchased in April 1948. In August of 1955, the Goodman family sold the mill and #9 was loaded on a flatbed truck and sent to Historyland Museum at Hayward. In the 1980s, Historyland declared bankruptcy and closed. 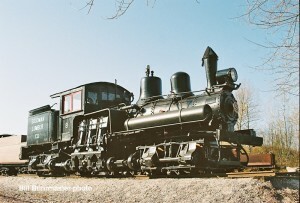 In 1988, Mid-Continent purchased #9 to preserve the last remaining Wisconsin Shay locomotive. It was moved to North Freedom in July 1988 and is presently kept on display across from the depot. Cosmetic restoration is being completed as time and funds permit.